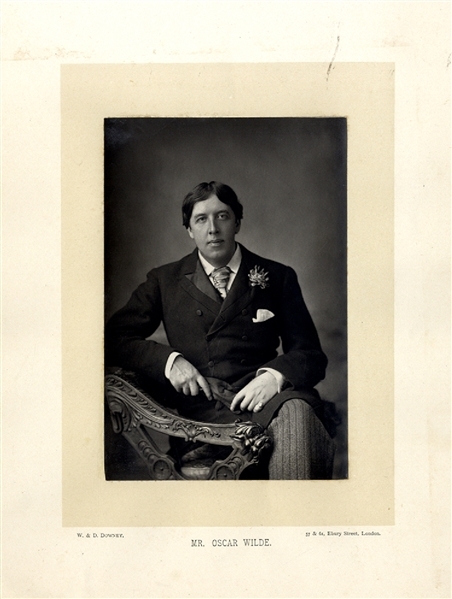 Albumen photograph of Oscar Wilde, by W &D Downey of London, 3-3/4”x5-1/2”, fine condition. Oscar Fingal O'Flahertie Wills Wilde (1854-1900) was an Irish poet and playwright. After writing in different forms throughout the 1880s, he became one of London's most popular playwrights in the early 1890s. He is best remembered for his epigrams and plays, his novel The Picture of Dorian Gray, and the circumstances of his imprisonment and early death.